Sorry for the month-long hiatus from blogging! I know it’s not an excuse but access to the internet at my parents’ central Wisconsin home is not exactly stellar! Obviously, I went home for a the holidays but then just decided to take a break from the blogging thing! But I’m back! So in observance of the commercialized, family-filled holidays I celebrate my first post is going to be about the non-traditional dessert I made a couple weeks after the holidays ended! Around Thanksgiving I found this recipe for a pumpkin chocolate torte. 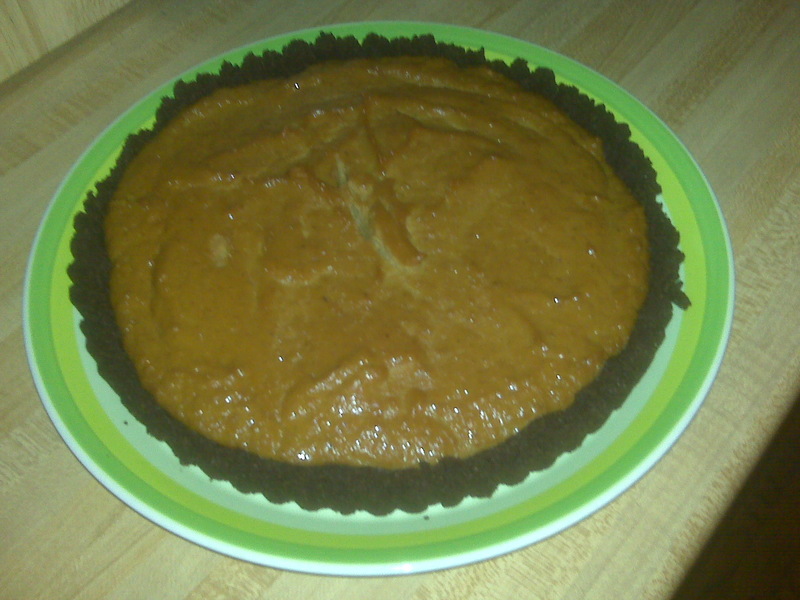 I had a pumpkin filling (basically like pumpkin pie) and then a homemade chocolate graham cracker crust. However, the recipe called for heavy cream and I didn’t have that. So the next time I went to the grocery store I bought the cream…but I didn’t have time to make the torte until a couple weeks later and the cream had gone bad. The second time I bought the cream it also went bad. Then I decided I was going to make it at home over the holidays, only to actually read the entire recipe and realize that I needed a tart pan (which I didn’t have). So, my mom ordered one off Amazon for me and when I came back to Madison I bought another container of heavy cream (the smallest one by the way was way way way more than I needed so I ended up finding this website [http://www.supercook.com/] where you can type in the ingredient you have and it will give you a recipe that you can make! So, I ended up making cream scones which were really good!). I mixed the filling which was pretty easy but I was supposed to crush the graham crackers and make the crust in a food processor. My food processor is a mini one that I got for $5 the day after Thanksgiving two years ago at WalMart so I had to improvise. I ended up doing the crust in three mini batches but it seems to have turned out fine. The tart ended up being pretty good, not too sweet and really good with whipped cream! Moral of this post: read the ENTIRE recipe before starting because you may need a tart pan or a full-sized food processor to finish it and may need to prepare yourself to wait 2 hours for something that smells mega good!